having wanted a dirt bike most of my life and now that the tenere is paid for , i'm shopping..... 2 stroke or 4 stroke that is the question ….. i'm not an expert dirt rider by any means but I want to learn to ride better , figure dirt is a good school . 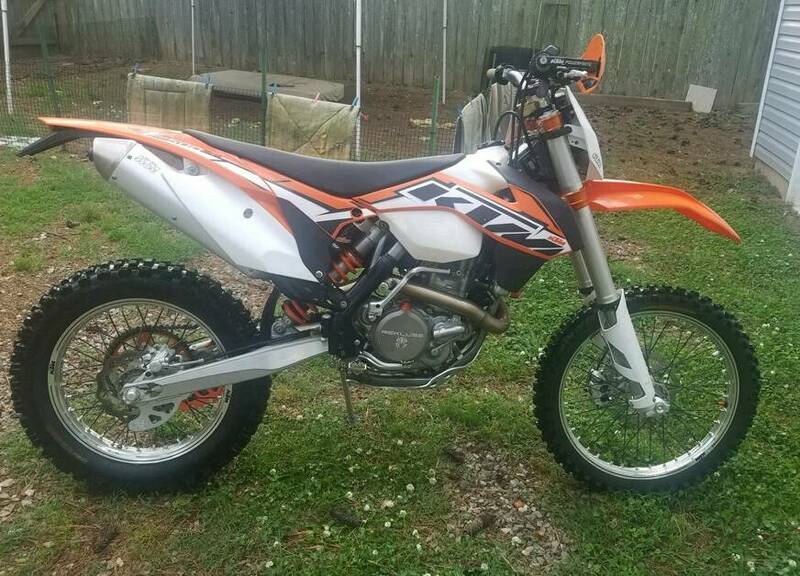 i'm really excited about KTM 300 xcw tpi , or 500 exc , or honda crf 450x and just maybe the new crf450l ….. wife has given her blessing . I have been practicing on my neighbors wr 450 , hasn't chunked into the trees yet but its still early. would like to know your thoughts and experiences , just so ya'll know I don't buy used , I will tear up my own machine and hopefully not me with it.... finding some great prices on the honda " X " , thinking it will be my choice based on price and what I can do to it to make it mine. thanks guys , looking forward to your ideas and comments. That's my department! Avid off-road rider for 25+ years I've ridden mostly KTM 2-strokes(250s and 300s) since 2005, Yamahas prior and started on old Honda XRs like most. What terrain will you be riding? Single track or double track? Gnarly stuff(Erzerg Rodeo), desert racing or more leisure kind of riding? I'm a 2 stoke fan. Twice the power for CC. Way easier to work on. Sounds like a real dirt bike, not a big fart! They are making a huge come back. Yeah, I've been eyeing up the new Honda CRF450L too. I just read the review by Revzilla. For the type of riding I've been doing lately, it's looking good. Honda is working with IMS on a 3 gallon gas tank to replace the stock 2 gallon tank. It sounds like there is a 5 year extended warranty available for a total of 6 years coverage...unheard of for a dirt bike. Talltourer is right on his comments about where you intend to ride it will narrow down your choices. Does it need to be street legal? Have fun and buy something before your wife changes her mind. Also, there's nothing like a 2 stroke for power and response. good afternoon guys , thanks for the response. I believe my secrete self wants a 2 stroke ( that's what all my friends had in high school ) I believe they are everything 'eems' and 'TT' say . so what im going to do to the bike is a moab Utah trip , and i am thinking a 2 stroke is perfect for there. I plan on using it the rest of my life around central texas playing in the dirt learning to do single track just have some fun on it and with it. the 4 stroke possible choice is because well that's familiar , and one tends to go with what they know. dual sport would make sense if I wanted to ride a lot on the street it would be the more versatile choice ( but then there is lots of insurance cost etc. ). but I already have a street bike (tenere) for street riding. but the ability to ride a bit legal on the street would come in handy at times, so plated whatever would be good ( plated 2 stroke is what I thinking im really wanting ) hoping my ramblings are leading to the correct choice . 4 strokes are heavy, heavy is bad in technical riding , wide open areas say long gravel road rides maybe 4 stroke a better choice , that's where lack of 2 stroke knowledge hurts . been working the night shift so im not too coherent this afternoon. will work own a more organized post tomorrow. talltourer, I can say this no erzburg ,erzerg or what ever that place is in Austria. im thinking cow trails is more my speed. And dont be scared of looking into the 250. Even at 260-ish lbs, I had more fun and more than enough power on multiple 250XC-Ws over the years. Almost the same top end but a more manageable low-end and easier to "beat on" and have fun. Could be a good negociating point also since people all go "for the big badass 300" and get some $$ offf a 250. If you decide KTM 2-stroke, 250 or 300... get the 2017 or newer as the counter-balancing makes a big difference if you plan to ride more than 30min at a time. They make a 125/150 but you shouldn’t weigh more than 150lbs if you go that route. The 150 is unstoppable on trails with a ton of pulling power down low. I believe and understand lighter is righter especially in technical terrain. that being said it may boil down to ergonomics , as I am not a small guy at 6' 2" and 250 lbs , riding the neighbors wr450 a bike not in the least set up for me feels small and cramped . standing on the bike seems like I may fall over the bars as the bar seat pegs triangle is not to roomy. yesterday im on the tenere standing on the pegs and marvel at how much room it has and how comfortable to stand there. is there a dirt bike close to the natural riding position that the tenere has , that or something close to that would be nice. I at one time had a dr650 it was more comfortable to stand on than the wr450, so im thinking ergo's are important . so what bike offers the most room and natural stand up riding position , if your wore out and sore at the end of day because the bike is to small im thinking you might not want to ride it much. That 450 would fit you well with a high seat and higher handlebars, Easy mods. Bar risers, tall seat. Made wonders for me on my KTMs. All available in the hardparts catalog also at a decent price. That's something else I did not mention about the 250s I had over the 1 300 I owned. The 250s would tire me alot less after a long day of riding single track around here. More power is not always better. good farkles to consider ( skid plate , a better seat , larger gas tank , bars and bar risors ) are on my list now. im enjoying the process of learning and figuring the best bike for me, I haven't mentioned that I sat on a brand new ( is there any other kind at the moment ) crf 450 l , it seemed nice and roomy , going to have to check it out some more , the 450x also seems roomy , got to do more seat time reseach. While it is a 4 stroke, you might consider the 350 XCFW or variants on it. IT's tall enough, 236 lbs, and 52 hp (more than the Yam 450). Depends what kind of dirt bike you are looking for. I have ridden dirt for about 50 years and now, enjoy dual sport type of riding. Presently have a DR650 and KLX250S, plus vintage Bultaco MX and hare scrambles models. I recently sold a DR350 with a 435 kit in it. I really enjoy riding unimproved back roads and 2 track trails now, with some single track on my Bultaco 370 Frontera that I compete in vintage racing with and a 360 Pursang that I ride in vintage MX. In the past, I have ridden the original CRF450X and liked it, but found it a bit more than I needed on tight trails, and found my CRF250X much easier to ride. I'm relating all this just to explain what I enjoy in dirt and off road riding at this stage of my life. I recently took a demo ride on the new CRF450L. I found that it was much more than I was looking for in an off road bike and certainly one that I would not enjoy riding as a dual sport bike. The engine is much more responsive than the old 450X and the whole bike seemed to me as a race bike with lights. While some may find this to be just what they were looking for, I would never pick it for dual sport riding. If you are new to dirt riding, I believe that you may find it a bit challenging. Take a demo ride and I think you will quickly decide if this is the type of dirt bike you are looking for. good info fredz43, I am mostly as an adult street oriented with my tenere , I have some dirt experience , but that was along time ago . my last dual sport was a dr650 , great bike but heavier for what im planning to do , a moab Utah trip . my short list of bikes are ktm 500 exc-f , rode the neighbors around didn't seem to much , ktm 300 xcw or xcw tpi , always wanted a 2 stroke (again) , and i'm leaning that direction more and more. finding that there are mods to calm the 2 stroke hit down a bit . the honda crf 450 x because mostly the price , there are tons of new left over 'x" every where , found a '16 model for a little over 6k , leaves lots of money for farkles . it has flaws but are known and addressable . the crf 450l is to damn pretty to drop in the rocks , little aftermarket for it ,yet. I had as a youth a 401 maico , beast had two speeds , nothing or warp 9. I am thinking modern 2 stroke are more ridable for the average bear like me. could be wrong . if I was ready today it would be a choice between ktm 300 xcw (or tpi version ) or honda 450x though the honda is heavy , it may have the ergos to fit me . I admire guys who handle the dirt , and I am thinking I want a bike I can learn on and grow on , I need 2 bikes I think but wife said 1 only. stroke at a gas pump in the middle of a ride . PS MH , If you think I ride fast on my Tenere , you won`t want to follow me in the dirt . LOL .